Styrodoc sorters are the ultimate in literature organisers. Available in 2 (duo) or 3 (trio) wide compartments. These units are great for storing literature, paper and catalogues. 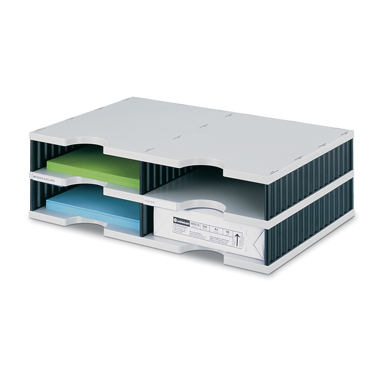 They are ideal as desk top units or can even be configured inside shelf units. Styrodoc sorters have unique undulating walls which give the units great strength and stackability (up to 12 levels high).